The passion with which he dons his red coloured, company uniform reminds you of the racing crew at a Ferrari pit stop. And the professionalism is evident from the way he handles the spark-spewing torch. 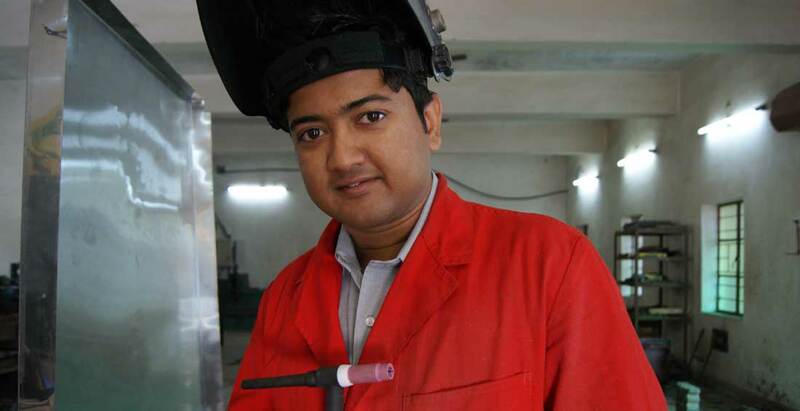 Tanveer Reza, who 'never had any direction in life till he joined Don Bosco’, is today an instructor with Lorch, a German welding equipment manufacturer. “My life was quite aimless till I completed school,” says Tanveer. “It was only after I joined Don Bosco, Park Circus, Kolkata that I slowly woke up to the realities of life. I decided that I had to do something on my own instead of depending on my parents forever”. His father was a fabricator with a small private firm and his mother a housewife with five children to fend for. Realisation dawned before it was too late and Tanveer chose to take responsibility for his life. “At Don Bosco, I was taught that hard work and perseverance pays,” he says. And that is what he decided to do. He joined the welding and fabrication course at Don Bosco and successfully completed the advanced training in Tig and Mig courses as well. At the institute, what really made him stand out was his commitment to excel and passion to work hard. Soon after his course completed he managed to become a trainee faculty at the institute where he did “almost everything like taking classes, fabrication work, handling welding jobs, working on machines. “The job at Don Bosco offered me the opportunity to taste the world of practical, real time work,” Tanveer remembers fondly. “It also did the all important job of moulding my personality for the work place”. Though, he pursued his studies by joining the Jadavpur University for diploma in a mechanical trade, he continued to work as faculty with Don Bosco. In 2008 Tanveer got the opportunity of a lifetime when he joined Lorch, the market leader in welding equipment manufacturing. In less than a year, he won plaudits from his seniors for his brilliance and capacity for hard work was recognised as 'among the best employees' and was sent to Germany for higher training on the company's latest machines.